Under this navigation tag you will find the original articles and reviews I did on the Sony PXW X70 including plenty of sample footage. You will also find additional useful information on the camera provided by owners of this camera who also subscribers to this blog. 1) Can’t do 4k, 2) No XLR inputs for pro audio mics, so it’s more toward the ‘consumer’market (mainly for audio reasons). Otherwise video specs seem on par with the x70 for HD output. I found this page to be informative regarding you query. There is a similar question towards the middle of the page. Trying to get a more filmic look on the X70 while shooting XAVC. Any suggestions for settings, etc? No Gerald. Not really. I do all my work in post and leave the default settings on the camera. I’ve never been happy with any other settings though I know there is a lot of opinion on that matter on other forums you might check out. I never really liked the ‘filmic’ look (which to me, mainly means film grain) I started out in film and we were always trying to minimize it. But if you mean ‘cinematic’, a lot more is accomplished with lighting and depth of field than with internal settings in my opinion. Much of the “filmic look” also has to do with frame-rate. Film is shot at 24 fps, and using that setting goes a long way in recreating the look of film (and even though digital has replaced film on most movies and TV shows today, they are still shot at 24 fps). That said, if you are in the UK or Europe, you might want to shoot at 25 fps (as video in those countries is 25p / 50i). I am in America, where video is 30p / 60i, but I have found that even shooting at 30 fps convincingly replicates the look of the film frame-rate. I actually prefer to shoot at 30p, because of the “filmic” look. Despite the fact that 60i looks more “real” and “immediate”, I also think it has an undesirable sterility (like a talk show or old soap opera). Hello folks , is the 4k upgrade worth it now with a variety of camera choices ? without the 4k upgrade will I get 4:2:2 on AVHD or XAVC ? Hii Joe it is a very informative post. 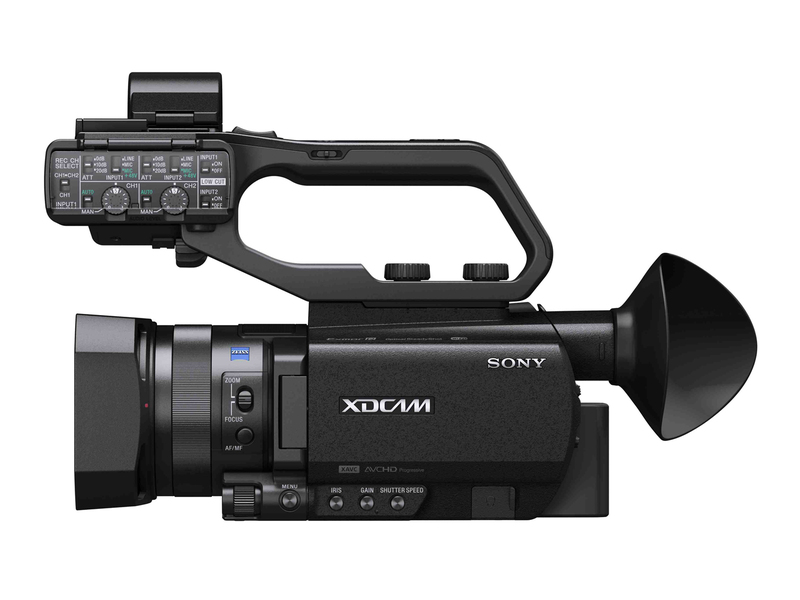 This is very useful for everyone who wants to know about sony PXW X70. Thanks for sharing this post with us. Hi Joe – first off, Thanks SO much for the work on the PXW-X70. Trained on the NX5-U, and since I picked up the X-70, review removing any reservations I had, I haven’t looked back. Loved run’n’gun as well, and have been recommending it to colleagues. My question is for some reason recently, with the auto/manual switch set to Manual mode I don’t seem be able to get rid of my auto settings. I’ve done 2 shoots where I’ve had this problem and luckily the camera is good enough to get fantastic results with auto, but I didnt have this problem before. I’m wondering what exactly is it that I’m forgetting to / or what other setting i accidentally activated that might be causing this? I’ve literally gone through the menu and checked everything that looked like it could be remotely related…. Any ideas on this phenom? When you put it in manual, in order to set the various things (iso, iris, etc.) where you want them, you have to push the button under each of those options on the side of the camera. When you do, it appears in a little white box. You then set the setting you want and move onto the next one. BUT, if you push the button again, it will return to auto for that setting. This is useful if, say, you want to lock aperture at f2.8 and leave iso or shutter speed on auto. Or you can set all 3 to full manual. Or just two. Thanks for the compliment on the book. If you haven’t left a review, please do. Gotcha! Great thanks so much! 🙂 Left a review on Amazon, happy to do it, really loved the book! I have the PXW-X70 and am trying to shoot AVCHD 720/60p HQ to get the 777 minutes on my 64gb memory card. I want to have the DATE and TIME displayed on playback. On the DISPLAY SET menu there is no option to select DATA CODE, it jumps from Shutter Display to LCD Bright and completely overlooks the DATA CODE option. Firmware is 2.00. I have assigned the DATA CODE to assign button 3 (in place of the picture profile) and there are no options that I can find to display that data. I had hoped a experienced person like yourself could help. I need to display the DATE AND TIME as I will be shooting some legal proceedings and this is a requirement. Any help you can pass along will be extremely helpful. Thank you. Just download the video files from the camcorder using the Import Media Files Tool from the Sony PMB browser. The Import tool automatically saves the files with names indicating the date-time, example: 20110611160828.m2ts (date 2011-06-11 time 16:08:28). 1. While comparing different cameras for producing educational videos, I came across your YouTube review of the X70. I wish there were similar reviews for other cameras as well. 2. The point I am trying to make is that your review was extremely helpful and realistic, in a way where I can ‘see’ if the camera meets my requirements. Now, it is in my shortlist. Thank you for your time and effort. It is greatly appreciated by me, who has very limited knowledge about the finer points of filming videos. If you need assistance in grasping the fundamentals of videography in a similar easy-to-grasp format, you might buy my ebook Run ‘n Gun Videography–The Lone Shooter’s Survival Guide. Cheap as chips. Problems with Noise if using HDMI out and XLR in. Has anyone else run into this? We use HDMI out to record f4v files on the fly, but now find that when we use XLR iinputs, there is a significant amount of noise in the background on both channels. No amount of switching things around seems to help. Unplug the HDMI, and the noise goes away. Will try SDI to HDMI or SDI to SUB next, I guess. Thoughts? No idea. Never use HDMI out. Anyone else know the answer? Just purchased a X70 but disappointed to discover the 4K firmware upgrade is 600 Euro in Europe. Reading the very negative reviews about the procedure on the B&H site, I think I am going to wait a while. Sony Europe’s website is a disgrace to professionals. Looks like something out of 1990’s. I just purchased the x70 and I had a quick question. On the xlr handle attachment, there seems to be a little play in the shotgun mic clamp. Is this normal? If it’s the ‘play’ I think you’re talking about, yes. That’s vibration dampening to help prevent direct transmission of noise through your body or tripod or whatever through the camera to the mic.